The lines between earned (traditional news coverage), owned (blogs and social channels) and paid media (ads, sponsored social, etc.) continue to blur every day. To be a truly effective public relations professional you need to recognize this reality and use this blended approach to reach your audiences. 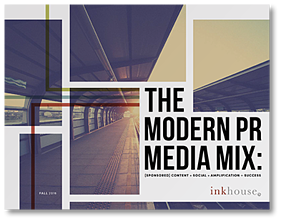 Our free eBook, The Modern PR Media Mix, explains how to use a blended media model to improve your overall results. Get the most out of your PR investment by using the complete media mix to your advantage. Download your free eBook copy by completing the form to the right.